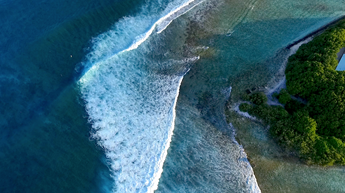 These are some of the best reef breaks you'll find in the Maldives and right next to Club Med Kani! With an array of lefts and rights, there's something for everyone! Info: the water temperature is 28/29 degrees! With many options taking a short speedboat ride to the waves, pre-booking an outing package or simply paddling out from the resort to the Ninjas break - advanced surfers will be thrilled in Kani! Tip: book in July/August for the biggest waves. ...But also the best place to learn! Keen to try out surfing in the best and warmest conditions? No worries, their ISA-certified instructors will take you through the basics of surfing in the best environment, in small groups or private lessons from Kani and on safe waves. Info: available from 11 years old.